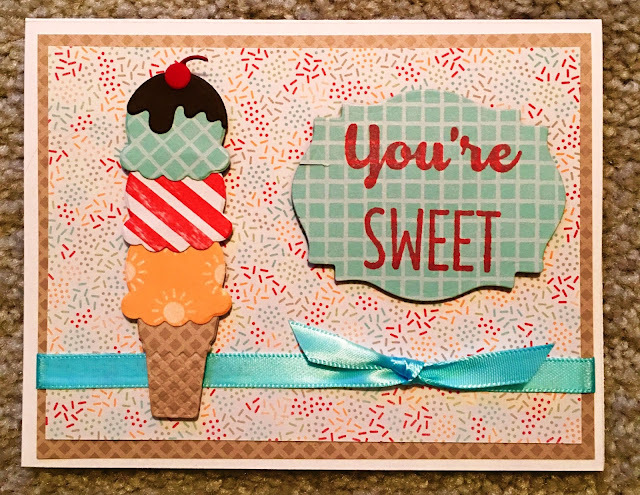 Today's card was made with a Stampin' Up bundle: Frozen Treats Framelits Dies and Cool Treats Stamps. The sentiment was die cut with Spellbinders Labels Eighteen. Also, to go along with this set I purchased the coordinating paper pack. This is the cutest set--so glad I got it. such a fun and sweet card! i love the festive background and the cone's texture. thank you so much for playing along with us at penny black and more. What a lovely creation and love your choice of colours, many thanks for joining us at Penny Black and More challenge. Lovely card. Love that the cut out image and papers are on the same theme.